There are various sterile spaces in hospitals which are highly at risk in terms of infection. HVAC systems play an important role on the infection risk in sterile spaces. HVAC systems for sterile spaces focus on number of particles, number and types of microorganisms, pressure difference between the sterile and its neighboring spaces, supply air velocity and air distribution in addition to the comfort parameters which are temperature, relative humidity and fresh air rate. Therefore, the design of HVAC systems for sterile spaces is more difficult and complicated compared to the comfort applications. 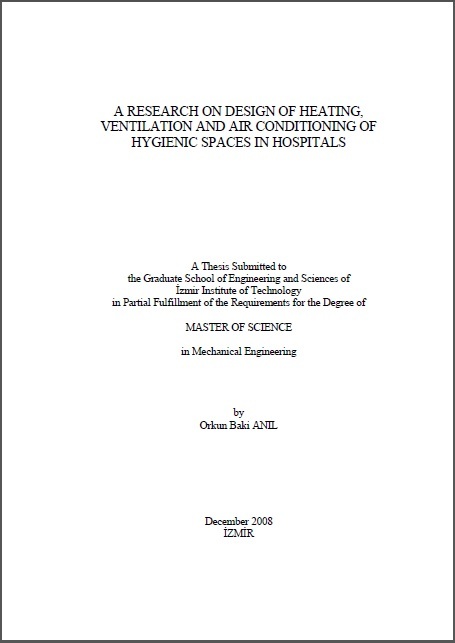 This study firstly reviews the design parameters of HVAC systems of sterile spaces in hospitals. A literature survey is conducted about the effects of the design parameters on infection transmission in sterile spaces. Also a literature survey on various standards and design guidelines for HVAC design parameters of sterile spaces used by different countries is performed. Secondly, an experimental study was conducted in an operating room to reveal the system performance during operation.